CubeSats - To The Moon & Beyond. Thursday, March 1, 2018 at 7 pm at Huntsville-Madison County Main Public Library Main Auditorium with Scott Spearing, Subject Matter Expert, Geocent, Supporting NASA MSFC. NASA is creating the new Space Launch System (SLS) for human deep space exploration. The SLS will also provide opportunities for payloads including cubesats to fly to the moon and further. We will be discussing the capability of flying cubesats aboard SLS on the first flight (EM-1), specifically describing the thirteen 6U-cubesats and their missions, destinations, and unique subsystems. We will also peek behind plans for upcoming missions and capabilities. Some display items will be present at the meeting. Above is an actual picture of the Orion Stage Adapter that will house the thirteen (13) cubesats. Can you see the cubesats attachment brackets? Picture was taken at MSFC. Learn more about SLS EM-1 Secondary Payloads (cubesats) . Scott Spearing (Geocent) is a Subject Matter Expert (SME) with 35 years of space flight experience starting with one of the original Get-Away-Special (GAS) experiments which flew on STS-7. 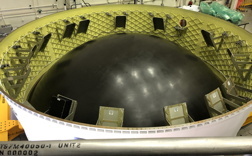 Scott was at the inception of the secondary payload deployment system for the SLS program and is currently assisting with secondary payload preparations for EM-1 and planning for future missions on the upgraded SLS vehicles. Huntsville-Madison County Main Public Library is located at 915 Monroe Street in downtown Huntsville. The main auditorium is on the right when you come in the main entrance.